The much talked-about Train 18 of the Indian Railways, which recently breached 180 kmph speed limit in the trials, has 20 percent of its components being imported from foreign countries. Although the train is seen as the finest example of technical prowess of the Indian Railways’ coaching factory, not all of its components are made in India. Train 18 is a semi-high speed trainset, which includes a group of coupled coaches that are individually powered by a propulsion system. In other words it is a locomotive-less train. The first Train 18 prototype was recently rolled out by the Integral Coach Factory, Chennai of Indian Railways. It is going through multiple tests to assess technical parametres and fix them before it is finally commissioned by the railways in January next year. 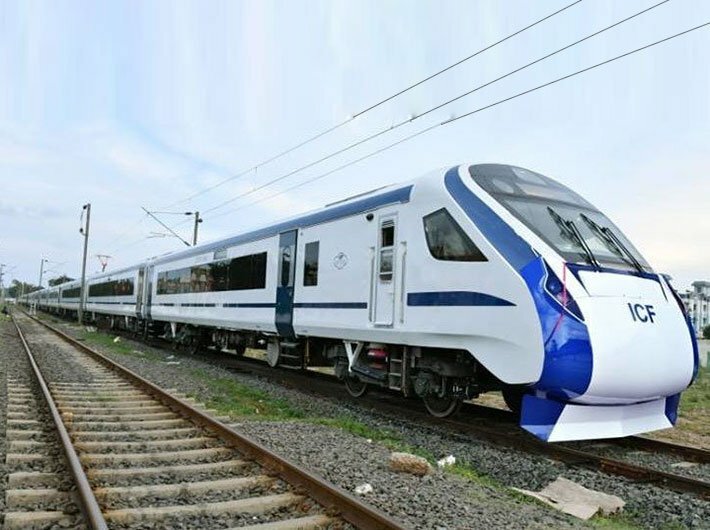 ICF general manager Sudhanshu Mani told Governance Now that 80 percent of the equipment and components of Train 18 were made in India but remaining 20 percent such as aircraft-like seats were brought from Spain and China. Sliding doors and plug doors were also imported from Germany and Czech Republic, he said. “To my surprise, no one makes aircraft-like seats in India but from third rake onwards we will try to make it in India or will have collaboration with someone,” he said. Mani said that a part of the pantry equipment was also imported for four coaches, and the remaining would be made under collaboration in India. The vacuum toilets were imported for the first prototype Train 18 but for the next rakes it would be made indigenous, he added. The second rake of Train 18 would be rolled out in February 2019, he said. The general manager of India’s biggest coach factory said that Train 18 was conceived, designed, engineered, built and tested by the ICF. Railway Board Chairman Ashwani Lohani had flagged off the Train 18 prototype on October 29 in Chennai and praised the manufacturing unit for coming up with so many sophisticated features, a conventional train has never seen in the past. The 16 coaches-long Train 19 will have the same passenger carrying capacity as that of the Shatabdi Express. Train 18 possesses aerodynamically designed driver cabins at both ends for quicker turn-around at destinations and it sports an advanced regenerative braking system to save electricity. The fully air-conditioned train offers better passenger comfort and safety, as all equipment are fixed under the carriage, so that more space is available on board, officials said.